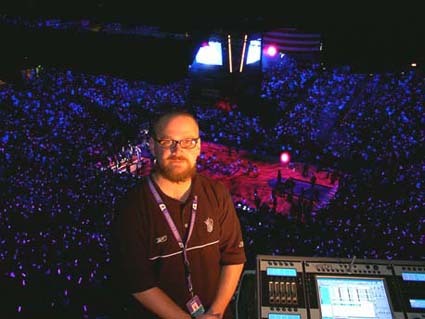 Lighting the team introductions for the NBA playoffs in a 442,000 square-foot arena provides some unique challenges. Kevin Stirling recently posted, on the Light Network, about his experiences with Vista and using VNC for remote control. DaVinci-Fusion, Inc and I brought the Vista to Sacramento’s ARCO Arena for player introductions at games 3, 4, and 6 of the first round of the NBA Playoffs. There would have been more shows, but when you lose you take your toys and go home. The Vista, of course, performed flawlessly and poetically again this year, but that’s not the point of this post. I wanted to make it clear how thrilled I was with the performance of the Vista under VNC control over a wireless router during programming, install, and rehearsal. My console sits in the farthest upper reaches of the arena: Northwest corner, catwalk, 90′ above the deck. While affording a bird’s eye view, this position also creates issues with line of sight during programming (scoreboard obscures at least 15% of the house), so invariably some base foci are difficult to verify without multiple long walks around the catwalk. In the dark. At 3 am. Pinned on Rockstar Juic’d. You know how it is. This issue is avoided with one ride down the freight elevator, and a stroll through well-lit hallways back into the darkened arena where I’ve set up my lappy running VNC at the scorer’s table. There I get full access to Vista’s desktop and, in one short session, fix all the spots I previously couldn’t see. Update some presets. Fix some cues that don’t look as cool from the floor as they did from the air. Run the show again from another perspective. Ah, freedom. All that says nothing of the time I save on load-in. I used to set up the console once downstairs to verify the rig pre-fly, and then again upstairs with the rig at trim. Now there’s only one set-up upstairs; control is verified from the deck pre-fly and at trim via PC. Nor does it tell of the assured smiles and dulcet tones I receive from our client, the Kings’ Director of Event Presentation, when I can sit next to him during his rehearsals and be present for all discussions of content not necessarily transmitted over comms. Additionally, if I’m on the floor, my sales manager can talk to me and still collude with the powers that be. That makes him feel better. That, in and of itself, makes my life easier. In short, don’t be afraid to VNC your Vista. I ran that sucker wireless at a good 500′ range in a building filled with steel and other wireless systems running rampant. Lag was sometimes noticeable, but not prevalent. I didn’t feel secure enough to run the show from the lappy due to the lag, but it may have worked. More experiments with same are forthcoming.